Take your seat, ladies and gentleman because there is a new show in town! Calling all fans of TV shows, lovers of slots and those passionate about winning: the online casino software group, Rival Gaming, has rolled out a brand new slot game and the reviews are already sensational. 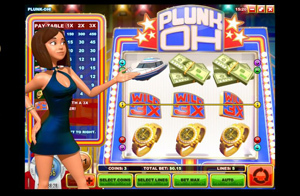 The show-inspired Blunk Oh slot is Rival’s new 5 pay line, 3 reel game that is not only profitable to play but also extremely fun. South African players will be able to find the new game at sites such as Superior Casino and 24VIP Casino, online casinos that not only carry Rival Gaming titles from its extensive portfolio, but also cater to local players and are among the most South-African friendly gaming sites in the business. But back to the new Blunk Oh video slot. Rival Gaming has taken some of the most popular TV show games in history and combined everything fun and entertaining about them into one fantastic slot game. Just like in real life television game shows, contestants try their luck to win big prizes. In this case, it’s the bettors who are spinning for wins and claiming their rewards. Rival has made this game even more authentic by having the symbols of the game displayed as wads of cash and luxury prizes. These include things such as cruise tickets, motorbikes, gold rings, sports cars, gold watches and luxury boats. The Wild Blunk Oh logo is the highest paying symbol in the game and is worth landing! If you land three of the same icons on a single spin, you will start winning big, depending on the high-paying symbols. 3 Gold Watches, for example, pay out 30 coins, while three of the Blunk Oh wild symbol pay out the jackpot prize of 450 coins. The wild symbol is extra lucrative because all winning combinations that it helps create are trebled thanks to the 3 x multiplier. Coin sizes in this game range from 0.01 to 5.00, with the chance to wager 1 to 10 coins per line.